We live in a globalized and interconnected world, and whether we realize it or not, we are affected by events, forces, trends and people far beyond our national borders. What happens in other countries, and how our diplomats deal with it, has an impact on our security, prosperity, health, privacy, ability to travel and much more. If they keep dangerous foreign citizens out of our country, negotiate trade agreements that create jobs at home, succeed in containing and eradicating deadly outbreaks, and persuade other governments to crack down on human trafficking, we can all sleep better and enjoy our way of life. Failure, on the other hand, can threaten that way of life. 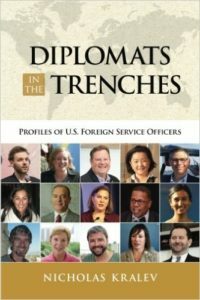 Average Americans may not relate to diplomacy, but they do relate to other people’s stories — and diplomats have incredible stories to tell. While few dine with kings and queens, many more are targeted by terrorists, carjacked or exposed to severe pollution and epidemic diseases. 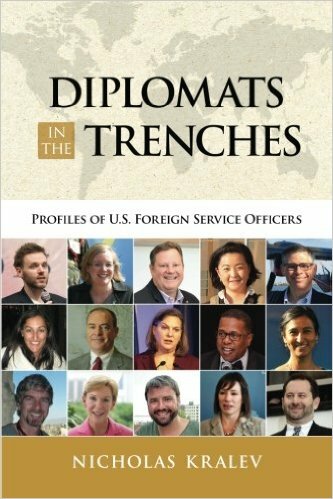 A natural successor to America’s Other Army, which focused on the U.S. Foreign Service as an institution, Diplomats in the Trenches is about some of its members — about their work and their lives, because diplomacy is not just a profession. 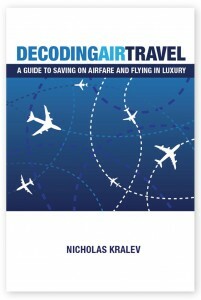 It affects every aspect of a diplomat’s life, and that of his or her family. 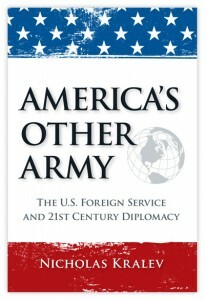 The Foreign Service has about 13,000 members, some 8,000 of whom are officers, or diplomats. So there are many more than the ones included in these pages whose stories deserve to be told — and perhaps they will be, in future volumes of this work. It’s all up to the readers. This entry was posted in Diplomacy, Latest and tagged Diplomacy, Diplomats in the Trenches, embassy, Foreign Service, State Department. Bookmark the permalink.